Alarm at 6:10. The restaurant and the fast food place downstairs both don't open until 7:00 am, and the border may very well not open until 8:00 am, so it's a slow exit, 9:10 am actually. 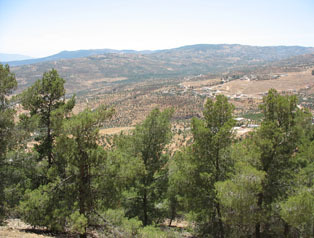 The day is scheduled to be easy though, about 50 k, and I think I'll take a rest-day at my destination, Olive Branch Camping Resort, outside of the town of Jerash. 13.67 kilos, or 30 lbs of gear. That's basically identical to the past two rides, so it sounds right. At the border the Syrian exit is easy, but the Jordanian control-point is a bit more serious. As I bicycle past the usual backlog of vehicles, I see cars with their doors dismantled, rear seats out on the asphalt, stuff spread everywhere. I'm waved up to the front, but that doesn't mean that I get waved-through. One bag is pointed at (my stuff sack containing sleeping bag and tent) and I'm asked to spread-out the contents. They're satisfied, and I'm instructed to get in a line waiting to enter a very small shack. Something is said about "personal inspection." The four men already in the line each wave me to the front. I resist their politeness, but finally accept the bump to the front of this line. "Personal inspection?" No wonder they're giving cuts! Inside the shack, the man looks at my passport, stamps it, and waves me out. 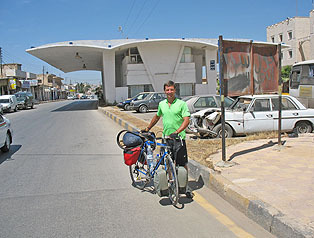 I get the bike, pick up a few tourist brochures in the building next door, convert $200 at the exchange kiosk and ride into Jordan. About a minute or so later I spot this unusual building with wings overhanging the roadway. Wow! I've been here before! I pull over, dig through my panniers to find the photos I'm traveling with, and there it is! I ask a local to take a picture of me with this piece of my past from forty some years ago. The ride is nice, but a bit hot. I take a soda break right before noon, walking a few paces up from the roadside soda shack to get under the awning of the closed restaurant. I get ten minutes of peace before the whole family crowds around to watch me drink soda. Soon the father, Abddallha, introduces himself, then asks me to vouch for him when he applies for a tourist visa to the US. He emphasizes that he is Jordanian, not Palestinian, and he mentions that he is also a policeman in Amman. I try to tell him that I don't think that I will have any influence. After a lunch break (again, under trees, to get out of the sun) I come to a sign reading, North Jerash/Ajlun. Hmmm… LP says that the closest hotel to Jerash is the Olive Branch Resort, outside of town on the Ajlun road, so this could be right. It's a very nice ride-a pine forest plus a view-but very soon I'm climbing and then on a serious downhill. I don't want to find out that this is the wrong direction, so I'm trying to find someone to ask for directions. I truck pulls out of a side road and I rush over to ask, "Otel?" The driver points in the direction I'm headed and replies "Yes, otel. Seven kilometers." That sounds pretty specific, so I feel OK about continuing. I continue dropping down the hill. I approach a car, and ask directions, and the driver gestures for me to follow him. He leads me up to a busy traffic circle and waves for me to continue straight. Wow, there are Roman ruins on both sides of me! I climb this road and spot a slick tourist information building. It's behind a gate and the guard says I need a ticket, but I try to explain that I simply want directions to a hotel. Another guard comes up, points further up the road where there's a red sign, just visible. "Otel," he states. I bike up there and it's the Hadrian's Gate Hotel, right opposite the ruins. This sure wasn't in the guidebook! 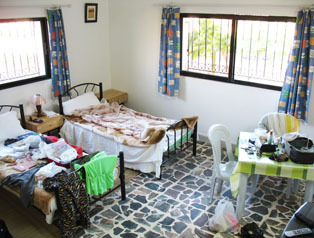 It's going to cost me 20 JDs a night (~ $28) but that seems much better than riding back out of town to the Olive Branch Resort, plus this room is as clean as can be. I'm getting a three-bed room for a one-bed charge of 15 JD, plus 5 JD private room surcharge. Wow - It's got 24-hour hot water, fridge, satellite TV, a clean towel and even a store-wrapped bar of soap. I settle in, spread out my stuff, then ask the manager where I can get a beer. "Perhaps only one place," I'm told, "Restaurant Yahalla, back at the traffic circle." So I pack one pannier for going out for lunch and a late afternoon visit to the ruins. The Yahalla is very nice, with a high-end presentation, and prices to match. I've never had my bottle of beer served in a bucket of ice, but I also haven't paid 5 JD plus 21% tax plus 10% service charge, or almost $10 for a single 500 ml Amstel. Ouch! But the place was very nice, the service was classy, the food was fine, and after another hot day riding a loaded bike, the beer was worth it. After this late lunch I bike up back up the hill a kilometer or so to the entrance to the ruins, and-damn!-my sunglasses are missing. I'll find them later. I pay 8 JD to get in, I have my tunes playing, but the brightness gets old, and the mood isn't as magical as it's been at other ruins. It wasn't clear if I could hang out in the ruins after closing, so I walk the 2 k loop inside, take the obligatory photos, and I work my way back to the exit, where I bicycle across the street to the hotel , to check for the glasses, then back to the restaurant, where I must have left them. It's only about one kilometer, but I'm feeling beat. I learn that they did find the glasses, but the manager must have them and he is unreachable right now. I hang out for about 20 minutes, but decide to head back to the hotel before it's totally black outside. Heading back to my hotel, I pull over at a shack to buy a 1.5 ltr jug of water. I'm charged 1.2 JD, or $1.70. Either this country is really expensive, or Lonely Planet missed on the population's tendency to rip-off tourists. Back at the hotel I spoke at length with the manager in the hotel. He is from Yemen and comments that there is a bit of the resistance in the local community to him. Business is slow, but his hotel is appearing in a French guidebook now, so it's just a matter of time until the other guidebooks get updated. A bit later there is knock on my door and the manager from the restaurant is there with my sunglasses. That's great! Afterwards the hotel manager says something about contacting the "tourist police", and I'm confused to say the least, but apparently there's been a bit of bad blood between the two of them. I decide once and for all there is no way I'm riding tomorrow-I'm beat, and this hotel is very comfortable. 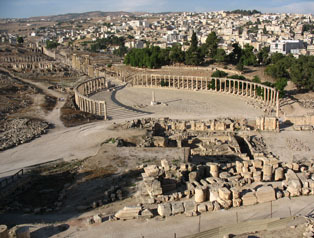 Monday, June 4, Jerash, Jordan Alarm at 6:11 in the morning. I try to maintain an early body-clock, but I definitely hit the snooze button a few times. I have hotel breakfast at 8:00 am, and speak with the manager's son for a while. I go back to the room and do busy work: the journal, throwing away papers, a bit of laundry, etc. I catch the news from the USA on the television, and there is a lot of bad stuff happening: 17 US dead in Iraq in what must be just the first three days of June, fighting's still going on in Lebanon, Turkey's shifting more troops to the Kurdish border. The Middle East. It's where the action is. Get food for tonight and tomorrow. Get candy to distract kids that may want to throw rocks in me. Get destination cities on my map written in Arabic. Right next to the hotel there's a sign indicating that there's some sort of detour on the road south. The hotel manager has said that the detour is not a problem and that the route south is well marked. He does state that the first half is hilly. Sometime in the next day I'm getting into the rock-throwing territory. Hmmm. 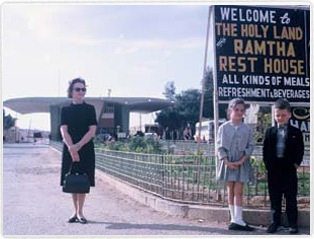 Somewhere around 1965 I had been at a place with a sign, Ramtha Guest House. I had googled the phrase before beginning this trip, but nothing popped up. Now I was here again. In the first picture, it might have been the actual border. Now it was about a kilometer inside Jordan. 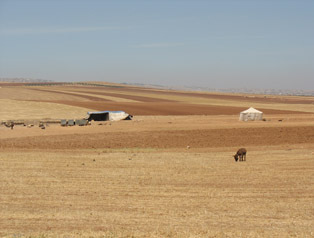 The country was hilly as I approached Jerash. The Hadrian's Gate Hotel was perfect. I spread everything out and settled in for two nights. 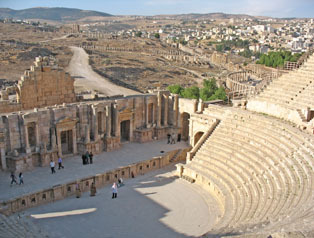 The Jerash theatre could once hold 5000. 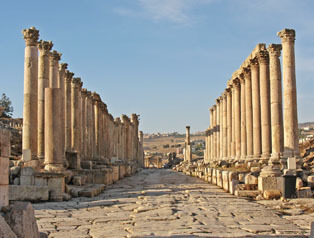 Jerash's cardo, or colonnaded street. You can see the ruts made by chariot wheels.